Stop the press – DermaQuest has worked out how to freeze time! As one of the world’s market leaders in stem cell technology and a renowned professional skincare brand, DermaQuest has taken anti-ageing, plant stem cell treatments to the next level with their new and exciting Sweet Chill facial treatment. Their scientific research and expertise and created a facial treatment that delivers incredible results when it comes to skin health and appearance. This advanced treatment uses cleverly combine products to recharge and reenergise the skin, reviving dull complexions by awakening and refreshing skin cells. Results are impressive thanks to the rich, deeply nourishing and transformative ingredients used. Skin is professionally cleansed and prepared for treatment using DermaQuest’s Essential Daily Cleanser, followed by the Peptide Glyco Cleanser and DermaPrime. The Sweet Exfoliate takes place using Dermaquest’s Glycolic Acid Resurfacer. This incredible product contains 30 per cent Glycolic Acid, Lactic Acid, Lilac Plant Stem Cell (Syringa Vulgaris Leaf Cell Culture Extract) and Green Leaf Tea Extract (Camellia Sinensis). These powerful ingredients significantly increase cellular turnover delivering a range of anti-ageing benefits including improved skin tone and texture. Antioxidants actively preserve and protect skin cells to enhance skin health and appearance even further. When the resurfacer is removed skin is left feeling refreshed and revived! 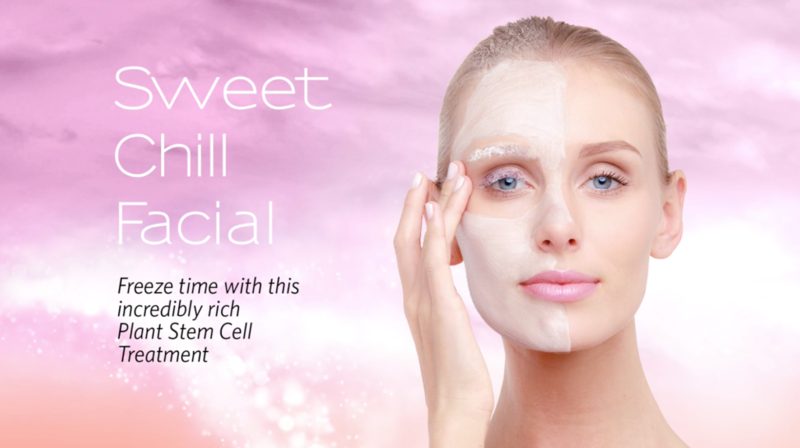 The Chill Stem Cell 3D Mask is applied to smooth, nourish and deeply hydrate the skin. Containing performance ingredients including Papyrus Plant Stem Cell (Rhododendron Ferrugineum Leaf Cell Culture Extract), Liquid Ice (Menthyl PCA), Marine Water MicroAlge (Nannochloropsis) and Acmella Oleracea Extract, this powerful mask promotes the skin’s own regeneration abilities resulting in a brightened complexion that is deeply nourished. You can physically ‘feel’ the mask at work as it cools and firms the skin. Client feedback about the relaxing elements of this treatment due to the products, skin sensations and application processes have been incredibly positive. Great results and a great experience too. Treatment is finished using DermaQuest’s incredible Essential Hydrating B5 Serum, their Stem Cell Rebuilding Complex and their SheerZinc SPF 30 for added environmental protection. This new and exciting treatment really does deliver retextured skin that looks smooth, even, bright and glowing. Fine lines, wrinkles and enlarged pores are reduced and sluggish skin is revived. Skin health is improved thanks to the regenerative, antioxidant and protective products. This transformation from dull and dehydrated skin to healthy vibrant skin can be achieved in 30 minutes. Posted in DermaQuest | News | Press | What's New.